I am a fan of tortilla soup. 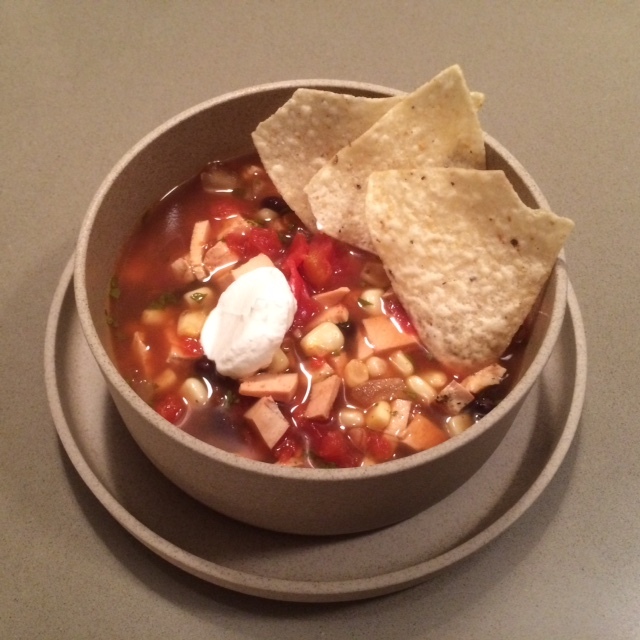 After seeing the movie, Tortilla Soup, I became quickly interested in trying tortilla soup. Can you believe I had never had it before watching that movie? Now I am addicted. It has been a while since we have made some at home. For a long time we made it religiously. Recently I found a crock pot version and thought it might be even easier than the version we made in the past. Note: We did not have raw chicken breasts, we had Trader Joes pre-cooked chicken breasts. Near the end of cooking we shredded them up and mixed in. You could probably use rotisserie chicken in the same way. I will just say that I had two full bowls. Between Chris and I, we ate the entire crock pot. Oops. Probably too much to have in one night, but it was oh so good. Thanks for this perfect winter (or any season) recipe. I forget about slow-cookers. Nothing better than opening the door to wonderful scents of dinner…and it’s your own!